Garden bulbs make a valuable contribution to the low-maintenance garden, producing colorful flowers for virtually any time of the year. The great thing is that the majority of bulbs will flower reliably year after year, with clumps growing and improving all the time, and once they have been planted they need very little attention. Most summer-flowering bulbs, such as alliums and lilies, are best planted in groups in a border. However, the easiest way to grow many spring and fall flowering ones such as Crocus bulbs is to naturalize them in grass. This eliminates the need for annual replanting and means that you don’t have to cut that part of the lawn until the leaves have died down naturally. It's advisable to keep naturalized bulbs restricted to one small area of the lawn so that the rest can be cut normally, that way it won’t look too cluttered. Naturalized bulbs and those left in a border for many years will eventually need dividing to prevent overcrowding, which would overtime lead to deteriorating results. 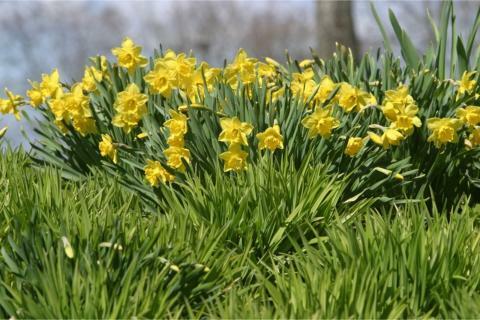 Lift large clumps when the leaves have just died back, or any time when the bulbs are dormant. Separate the clump into smaller pieces and replant. You do not have to separate them into individual bulbs. To create a natural effect, scatter the bulbs on the grass and plant them where they fall. Make a hole for each, roughly three times their own depth, using either a trowel or a bulb planter, which pulls out a neat plug of grass and soil. Insertion will be easier if the ground is moist rather than dry. Place a bulb in the hole, then crumble a little soil from the bottom of the plug and let it fall around the bulb to make sure it will not be left in a pocket of air. Press the plug back into position afterwards. For small garden bulbs and corms it is sometimes easier to lift and then replace the grass. This can be done by using a spade to slice beneath the grass, and then roll it back for planting. Loosen the soil with a fork, and work in a slow-acting fertilizer such as bone meal. Scatter the bulbs randomly as a uniform pattern will look unnatural in grass. Small ones can be left on the surface; larger ones are best buried slightly. Make sure to cover the bulbs with twice their own depth of soil under the grass, firm it well with your hands and then water thoroughly.